Saucony Cortana 4 are neutral cushioned running shoes. The Saucony Cortana 4 is the evolution of a strange serie because of its really low weight, outstanding cushioning and minimal drop, just 4 mm. As a result of it, this model is one of the most responsive within very cushioned running shoes. 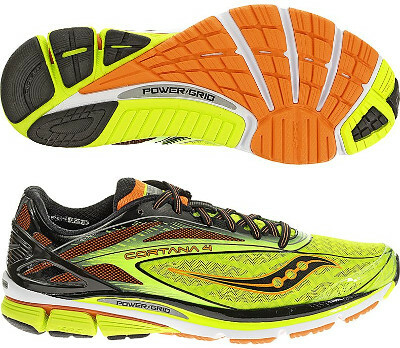 There are not many changes in this new version with regards to its predecessor the Saucony Cortana 3 and they are mainly in upper: the plastic piece in the heel has been redesigned to provide a better fit and a new seamless, lighter and more flexible material named FlexFilm is used for softer fit and better breathability. Some synthetic strips (Sauc-Fit) have been strategically located to embrace the foot trying to provide an optimum fit regardless stride stage. PowerGrid in the midsole is the reliable material responsible for cushioning and a minimal redesign has taken place in the sole to improve flex movement when landing, hence supporting a more natural and uniformed transition.